We are thrilled to welcome this California based artist to the Dollery! For many years we have admired her wide range of work. Karen describes her style as "diagonal" in nature. Each piece has a movement and a flow to it. Karen says that figuring out how to make the eye move over them as they stand there is the first step in making them seem to move. If you look closely you will see that technique in her pieces. 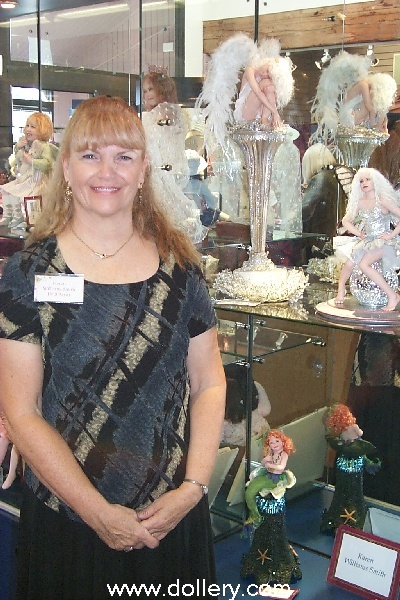 Karen has been sculpting since 1980. She has been in the doll world since 1993. Karen feels that mediums, sizes or subject no longer really challenge her sculpting when she wants to sculpt something she sees in her mind. She wanted to share this gift so she began teaching in order to pass her experience onto other artists. 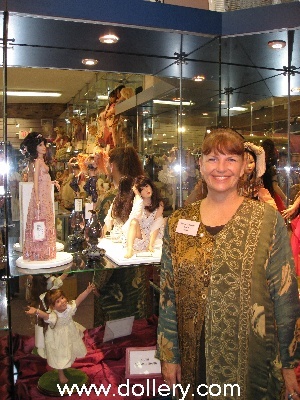 Karen attended our 2007, 25th Anniversary Doll Show! Please contact Kim at kmalone@dollery.com or call 781-447-6677 to get on our our mailing list for her work and notification on new pieces! New pieces will be here for our 2008 Show in October! One of a Kind, Full Body Prosculpt, Blue glass eyes, White angora mohair. 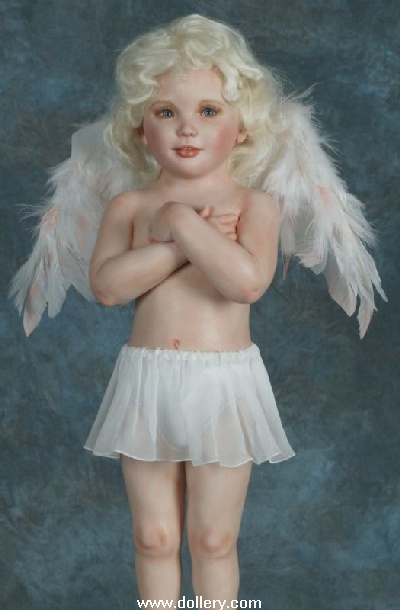 The doll is 17" and standing on the base the entire piece is 24.5"
Grace is dressed in a silk skirt. Her 8" diameter base is circled with antique flowers. Caroline is hugging her dearest friend ... her pet seahorse named Tippy. Caroline had carrot red hair of mohair. Painted brown eyes. She is covered in little freckles. She wears a necklace made of tiny, dried, natural seaweed and seed beads. 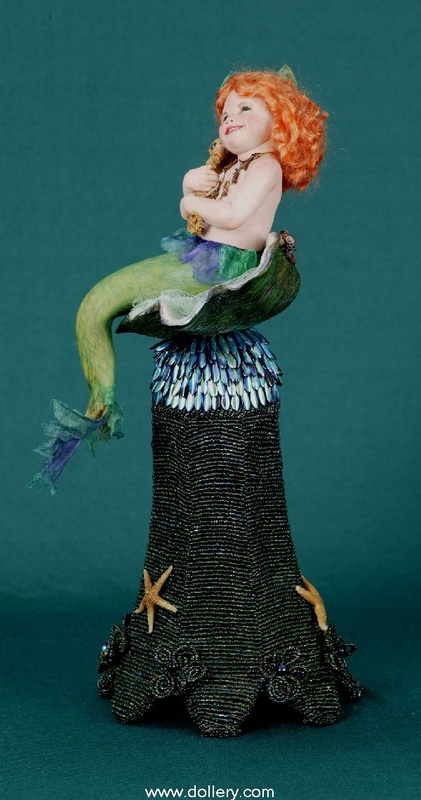 Her tail is covered with tie-dyed silk. 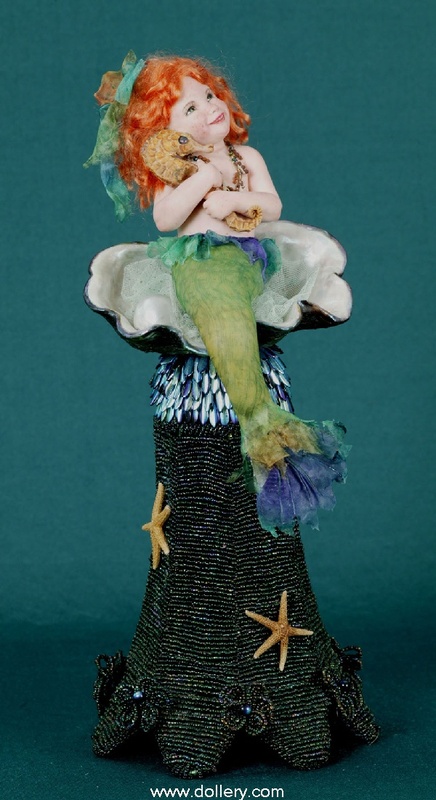 She sits in a sculpted shell next to a sculpted pearl. 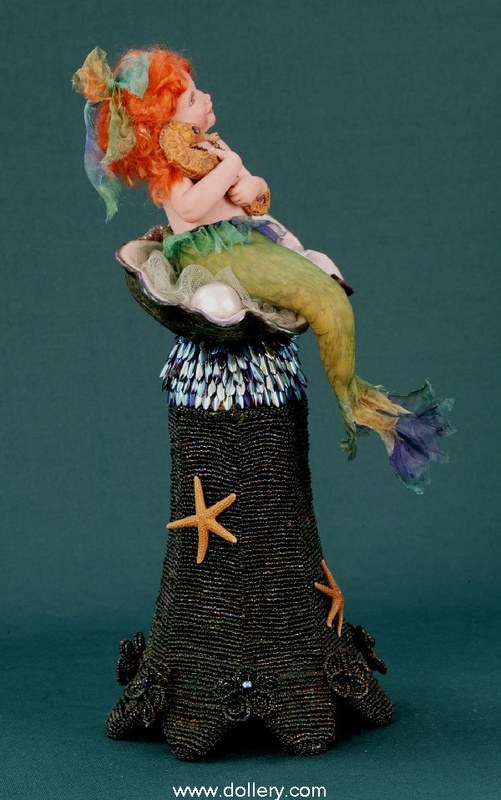 Her base is beaded and dotted with starfish. One of a Kind, Full body Prosculpt. Enhanced painted porcelain eyes, white Tibetian mohair. 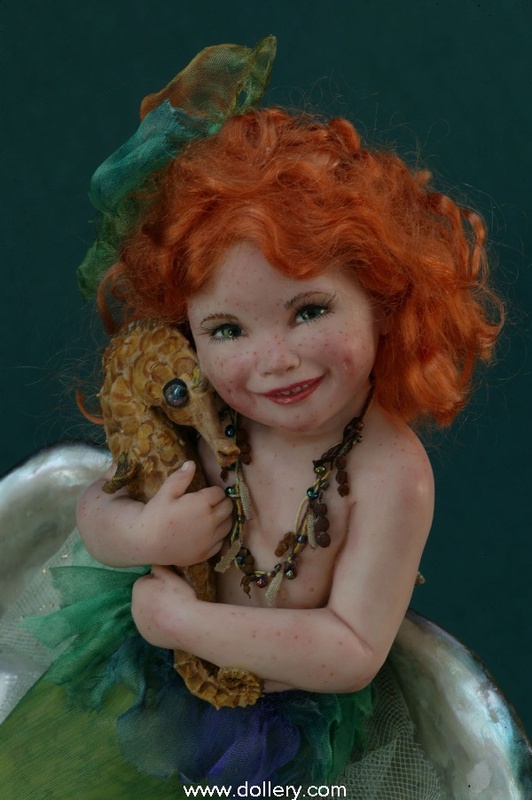 The doll with wings is 7" with the wings. The entire piece on the base is 22" (h) x 9" (w) x 9" (d) with base. 18" (with base) One of a Kind Prosculpt. Blue glass eyes, light red Tibetian mohair. Doll is 10 1/2"
Copyright /The Dollery - All images are property of The Dollery and can not be taken off this site without permission.